Darjeeling: The stage is all set for the TMC-GJM campaign rally in Darjeeling on Thursday. TMC supremo Mamata Banerjee, who will be a part of the rally, arrived at the town on Wednesday. She will be the first star campaigner to hold a rally in the Hills for this year's Lok Sabha election. The rally will be held at the Darjeeling Motor Stand on 11 am. 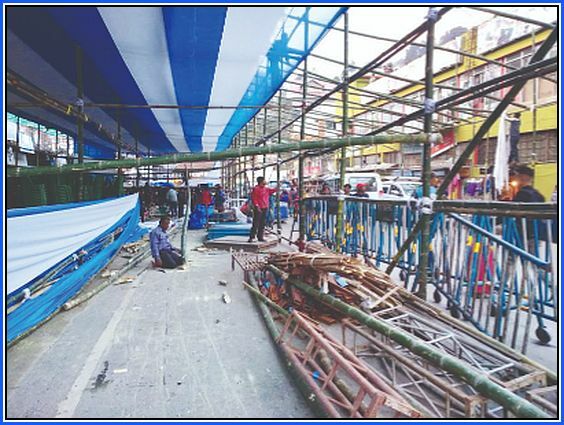 A makeshift venue (pandal) is being erected at the motor stand. Supporters and leaders of both TMC and GJM, along with the frontal organisations from Kalimpong and Darjeeling, will be present for Thursday's rally. On Friday, Banerjee will address a similar campaign rally in Kurseong. The rally will focus on GJM and TMC supporters from Kurseong and Mirik. From Kurseong, she is scheduled to depart for Siliguri. The TMC supremo, who is on a campaign trail, is camping in North Bengal at present. She will address a rally at Baghajatin Park in Siliguri on April 13. Banerjee's rally in Darjeeling is expected to draw huge crowds on Thursday. "I would like to apologise to all the schools as there could be traffic jams on Thursday owing to the rally, as people would be coming to Darjeeling from all over the Hills, including Kalimpong," said Binay Tamang, GJM president. However, the day being Thursday, most of the shops and business establishments in the Chowk Bazar area (where the rally is being held) will remain closed. "We also request all the TMC and GJM supporters coming from outside to enter the town by 9:30 am. We have arranged for car parking. From Mohanlal Petrol Pump near the Railway Station till Darjeeling Government College, vehicular traffic will not be allowed," stated Tamang. Vehicles will be routed through the upper reaches of the town. Vehicles of the supporters will be parked at the North Point ground, the parking lot in front of Government College and DRG Godown, Tanga Road and the road going up to Lal Kothi. The TMC supremo is currently putting up at The Retreat, a hotel located at Chowrasta, Darjeeling. Banerjee, who is fond of walking, could walk down to the venue from the hotel on Thursday. Meanwhile Amit Shah, the national president of BJP, is also set to address a rally in Kalimpong on Thursday. The rally will be held at the Ronaldshay Park in Kalimpong. Banerjee's rally in Darjeeling is expected to draw huge crowds on Thursday. "I would like to apologise to all the schools as there could be traffic jams on Thursday owing to the rally, as people would be coming to Darjeeling from all over the Hills, including Kalimpong," said Binay Tamang, GJM president. However, the day being Thursday, most of the shops and business establishments in the Chowk Bazar area (where the rally is being held) will remain closed. "We also request all the TMC and GJM supporters coming from outside to enter the town by 9:30 am. We have arranged for car parking. From Mohanlal Petrol Pump near the Railway Station till Darjeeling Government College, vehicular traffic will not be allowed," stated Tamang. Vehicles will be routed through the upper reaches of the town. Vehicles of the supporters will be parked at the North Point ground, the parking lot in front of Government College and DRG Godown, Tanga Road and the road going up to Lal Kothi. The TMC supremo is currently putting up at The Retreat, a hotel located at Chowrasta, Darjeeling. Banerjee, who is fond of walking, could walk down to the venue from the hotel on Thursday. Meanwhile Amit Shah, the national president of BJP, is also set to address a rally in Kalimpong on Thursday. The rally will be held at the Ronaldshay Park in Kalimpong. The stage is all set for the TMC-GJM campaign rally in Darjeeling on Thursday. TMC supremo Mamata Banerjee, who will be a part of the rally, arrived at the town on Wednesday.